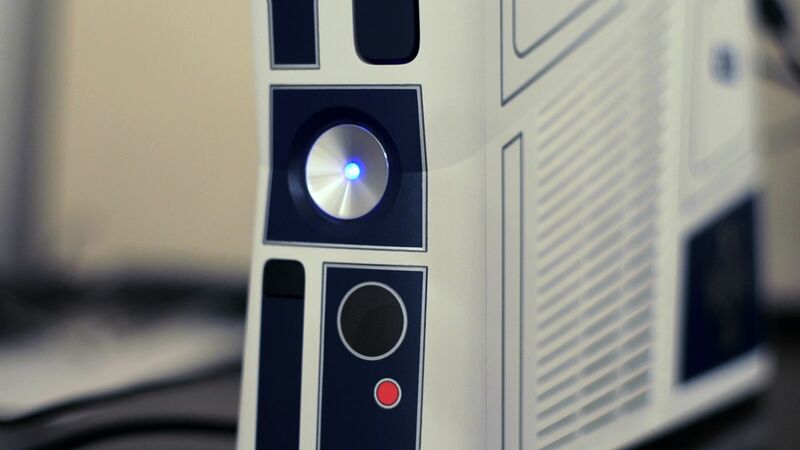 The special edition Star Wars version of the Xbox 360 looks like R2D2. Fittingly, it packs a secret message from Princess Leia, as you can see from this video that we shot of the unit. We haven't found any other surprises. And we're sure there are no jet-thrusters packed in its. The Star Wars 360 comes with a white Kinect and a C3-PO-gold Xbox 360 controller, as part of a package to hype the pending release of Star Wars Kinect. We'll have a review of that game next week. Aww I was expecting audio if you hit a secret button or something. Especially if it'd pick up the active gamertag & text-to-speech it "Help me xN00bFRAGGA666x, you're my only hope"
The blue light in the middle of the power button should project like R2 did in the movie. That's what i thought when i read the title. Yeah I thought it'd be a hologram. That was laaaaaame. Help me Marketing Team, I need to sell to geeks who'll buy anything with a reference on it! The article title should mention how crappy the message is. Dear Xbox. its time to go away. I would have liked to see something that triggered a video message on-screen. Ah well. We knew all this when it was first announced months ago. Old. News.